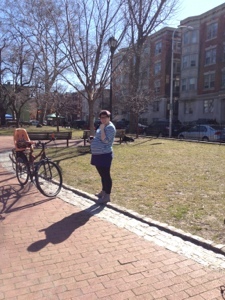 Firstly, at 34 weeks pregnant I think I biked my last "long" bike ride until number two arrives. After 16 miles and a mere 3 miles from home I tossed up the white flag and had my husband ride ahead of me to come back and get me in the car. I could have finished the ride but my gears don't shift well on my pink bike and it was taking a toll on my body. So white flag it was I do have to take care of M the following week no point in pushing it. The route out to the kidical mass ride is the bulk of our ride (and back home) the actual KM route was just 3.5 miles. The ride there I was nervous about getting there on time (volunteering my time and energy to get these rides going is no joke luckily I have roped others into helping. They are awesome! ) and my own 34 week slowness didn't help that. The ride to Fitler Square took us just shy of an hour usually we can do it under 40 minutes. We arrived and were greeted by some families waiting. M was anxious to get out and play on the sculptures. 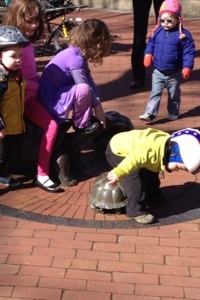 Who doesn't want to sit on turtles. Bikes began rolling in and boy did we have a display of cargo bikes. I think there were more cargo bikes then regular bikes several Bakfiets, trikes, big dummy, bullitt, & a kona ute off the top of my head. I don't even remember one kid trailer now I think about it. Rough count was about 45 people, kids included. That almost doubles the fall ride. Rolling out and keeping together went really well considering the size and length of the group. The ride took under an hour with all the stops and goes. 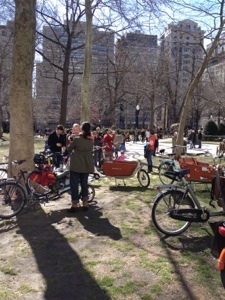 We ended at Rittenhouse where the group talked bikes and ate. Luckily the weather was perfect for March!! 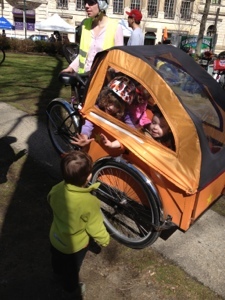 And the park was busy so we became advocates to passerby folks who were interested in our crazy lot of bikes. 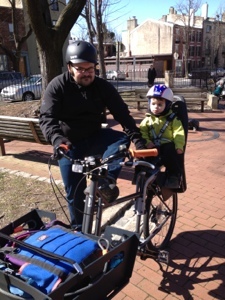 Next time we will have to print flyers of some sort to help understand kidical mass and cargo biking. 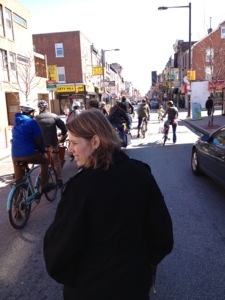 One person asked if we build a community by doing these rides. Totally and by far the best parts. Looking forward to the next ride the second Saturday in June! Until then I will have to work on having another baby and figuring out how to bike with said kiddo.